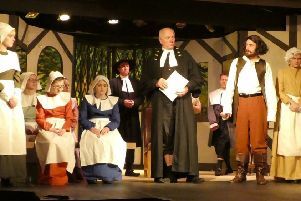 It’s a family affair for the cast members of an amateur dramatics group as a father, son and daughter are all part of a production. Ponteland Repertory Society will be presenting Aladdin, a new pantomime by Simon Sladen, from Tuesday, November 22 to Saturday, November 26 at Ponteland Memorial Hall. And the Long family feature heavily in the line-up of actors and actresses that will be taking to the stage for the production. Jason Long will be playing the show’s dame, his son Matthew Long is playing Wishee Washee, the dame’s son, which, somewhat confusingly, makes Matthew’s dad his mum for the production. And to add to the family capers, Jason’s daughter and Matthew’s sister Amelia is also in the production. She is part of the youth theatre group, the Preppies, who will also be taking part. A spokeswoman for the society said: “Come along for and evening of laughs, songs and entertainment. Tickets are £8 for adults, £6 for under 16s. Visit www.pontelandrep.co.uk and click on Ticketsource to reserve your seats. Shows take place at 7pm, Tuesday to Saturday, with a 2pm matinee on Saturday.